I am thrilled to share with you that, today, the Illinois House of Representatives passed House Bill (HB) 2275—also known as the repeal of Section 4.5. 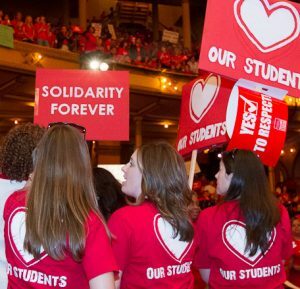 This bill restores our union’s right to collectively bargain over layoffs, class size, staffing levels, cleanliness, school day and year length, and other non-salary issues. 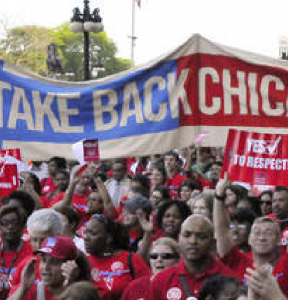 This right was restricted in 1995 by the Chicago School Reform Act, which effectively silenced the voices of Union educators and school employees, and gave the mayor of Chicago control of our public schools. Section 4.5 resulted in, among other ills, some of the largest class sizes in the state; woefully inadequate staffing of school nurses, school social workers and other clinicians, special education teachers, and teacher assistants; and the outsourcing of maintenance operations to Aramark that has resulted in filthy schools and dangerous learning conditions. These issues are mandatory subjects of bargaining in every other Illinois school district. Moving closer to the passage of this legislation puts Chicago Public Schools on an equal playing field, gives our students the proper opportunity to achieve, and returns to our union the power to challenge conditions that negatively impact their growth and our classrooms. Today’s action in Springfield ensures that every child in the state of Illinois has equal access to a high-quality education, regardless of their ZIP Code. Our heartfelt thanks to HB2275 chief sponsor, State Rep. Melissa Conyears-Ervin, and all of the co-sponsors of this bill. This is a major victory for our union and our school communities, and a crucial step toward equalizing the collective bargaining process between Chicago’s public schools and schools in every other district throughout the state. 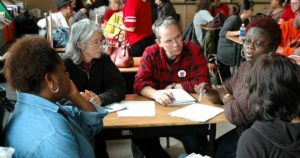 CTU committees are a great way for any member to make a difference. Join one now!